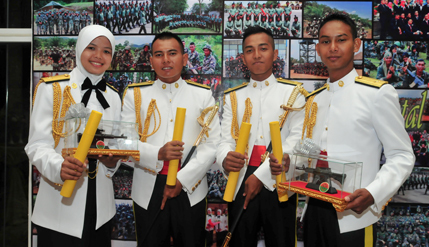 BANGI, 25 October 2014 – The 124 PALAPES (Reserve Officer Training Unit) officers from The National University of Malaysia (UKM) and Universiti Sains Islam Malaysia (USIM) have been urged to continue serving the nation after graduating. The Yang Di Pertuan Besar Negeri Sembilan Darul Khusus Tuanku Muhriz ibni Almarhum Tuanku Munawir, who is also UKM Chancellor reminded them to always remember their Alma Mater after graduating and serving in various professions. He was speaking at a Regimental Banquet dinner here today in conjunction with the commissioning of UKM’s 33rd series PALAPES officers by the Yang Di Pertuan Agong earlier. The Tunku Ampuan Besar Negeri Sembilan Tuanku Aishah Rohani Binti Almarhum Tengku Besar Mahmud, the Chancellor of USIM also attended the banquet. Vice Chancellor Prof Datuk Dr Noor Azlan Ghazali, an Honorary Colonel who is also Commandant of UKM Palapes congratulated the UKM unit for coming out as the Best Parade Formation among Palapes of all the universities for the second time. Prof Noor Azlan who expressed his pride for the unit hoped they can successfully defend the championship for the third time so as to be able to keep the trophy for good. Second Lieutenants Mohd Yunus Minhat and Izzat Mohammad Sohail Mohammed were declared the best PALAPES cadet officers for the 33rd series. PALAPES formerly known as ROTU is a joint programme between the Ministry of Defence and the Ministry of Education for undergraduates in the various Institutions of Higher Learning. An officer will be trained part-time during their three year stint as undergraduates through regular trainings that include military-related subjects every weekend. In addition, they also needed to do an advanced training through a three-week training course held once a year. The PALAPES programme now covers every branch of service – the Army, Air Force and Navy. Each unit has its own training facilities and headquarters. At present, PALAPES is already established in 12 universities.